Soaker Shopping in the U.K. :: :: iSoaker.com ::: iSoaker.com | Information | The Armoury :: Article Listing - Soaker Shopping in the U.K. I decided to go to a local Tesco store where I was (I am not sure if there are Tesco stores in the US or Canada, well, its a supermarket store, just like WalMart or some store like that) to look for some Nerf guns done by Lanard which I know they seem to stock there. Anyway, when I got there, I went down to the toys isle where the Lanard guns were, one caught my eye which I was thinking of getting, but that soon changed by what happened next. When thinking that there were no more toys I walked down the summer isle, I was walking seeing nothing that interested me, until I got to the bottom, and wow guess what I saw! I couldn't believe it! I saw Max Infusion Overloads, Flash Floods and exclusive Max D 5000 twin packs! I was so pleased, it looks like Tesco had done a little deal with Hasbro and beat big toy stores like Toys'R'Us at their own game! I really wanted to buy one, and I had enough money, and I also had my bank card with me! Perfect! Since I already had a fair few Max Infusion Flash Floods, my choice was between the Overload and the Max D 5000 twin pack, after all the regular shopping had been done, I decided on the Overload. However, when I have enough money I think I'm going to buy the Max D 5000 twin pack as well, perhaps even another Flash Flood. Anyway, before I go on, the prices of the guns. A fair bit I know, but that's the UK for you. Anyway, I'm rather happy with the Overload. I personally think that the pistol is what the STE Triple Shot should have been. It feels very nice, and while it doesn't have the best of power, its pretty good to use. I personally think the pistol works better without the backpack, although the backpack is going to benefit my Max Infusion Flash Floods greatly, so, overall I think I had a good buy. 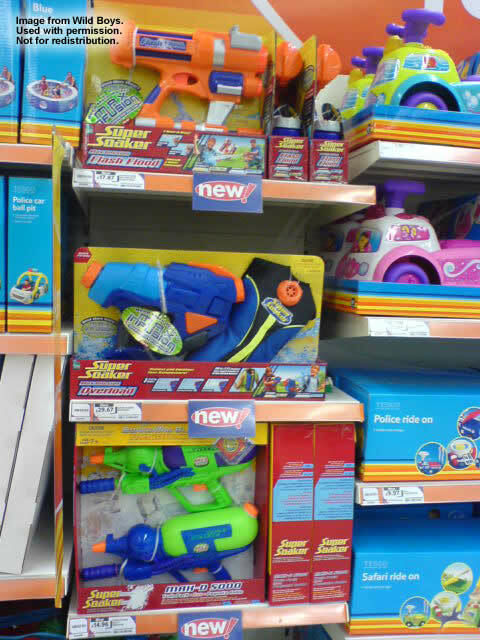 This message is really to let UK people know that the drought of new Super Soakers isn't as bad as I thought, and Tesco stores are pretty local all over the country, so you might be in for a surprise, I was. I'll report back when I get a Max D 5000 from there soon hopefully if they are still there. For now though, just to let you know its this is true and to gaze at the shelf, here is a picture I took when I was there.